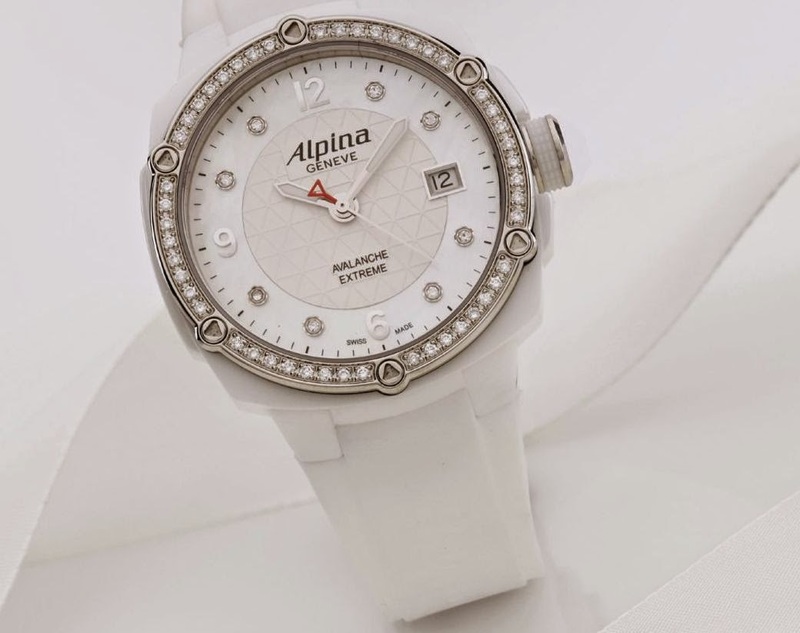 Crafted in an unexpected blend of unique materials, the Alpina Ladies Avalanche Ceramic Collection makes a bold personality statement, yet fits perfectly with the Alpina sporting tradition. These stunning new Alpina timepieces combine features such as understatement, technology, aesthetics and harmony of color. The Ladies Avalanche Ceramic Collection, available in white and black ceramic, is as ready to take on the elements as to dazzle at any evening function. With its eye-catching good looks and superlative comfort, today’s dynamic young women will instantly embrace this collection as a distinct choice. The Ladies Avalanche Ceramic Collection is available in several variations in either white or black ceramic. All models are equipped with a convenient, high-precision quartz movement (cal AL-240). The ceramic case sports a diameter of 42mm diameter, is 10 ATM water resistant, and comes on a comfortable and durable rubber signature Alpina strap. Available with a choice of either an elaborate diamond-encrusted bezel or a more understated version without diamonds, all versions come with a feminine and rich mother-of-pearl dial, finely decorated with diamond hour markers. White dial, hand applied Arabic indexes & diamonds indexes.